This family is a novel family of eukaryotic protein kinase catalytic domains, which have no detectable similarity to conventional kinases. 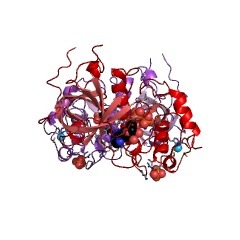 The family contains myosin heavy chain kinases and Elongation Factor-2 kinase and a bifunctional ion channel. 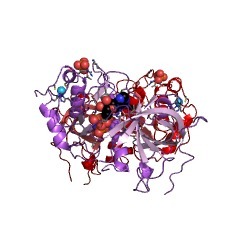 This family is known as the alpha-kinase family. 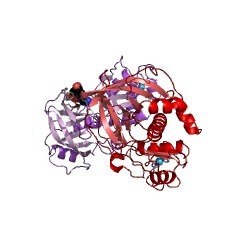 The structure of the kinase domain revealed unexpected similarity to eukaryotic protein kinases in the catalytic core as well as to metabolic enzymes with ATP-grasp domains. 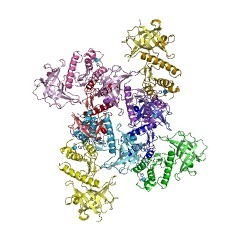 Proteins containing this domain consist of a novel group of eukaryotic protein kinase catalytic domains, which have no detectable similarity to conventional kinases. Proteins include myosin heavy chain kinases [(PUBMED:7822274), (PUBMED:9054368)] and Elongation Factor-2 kinase and a bifunctional ion channel [(PUBMED:11161216)]. There are 3220 Alpha_kinase domains in 3201 proteins in SMART's nrdb database. Taxonomic distribution of proteins containing Alpha_kinase domain. This tree includes only several representative species. 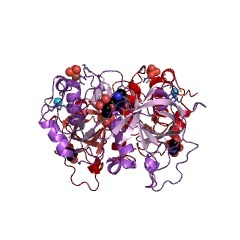 The complete taxonomic breakdown of all proteins with Alpha_kinase domain is also avaliable. Click on the protein counts, or double click on taxonomic names to display all proteins containing Alpha_kinase domain in the selected taxonomic class. 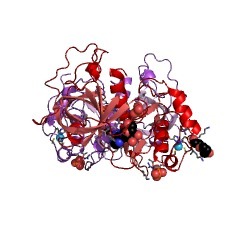 TRP-PLIK, a bifunctional protein with kinase and ion channel activities. 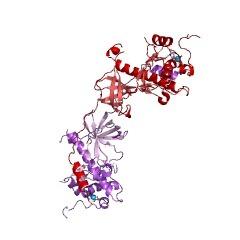 We cloned and characterized a protein kinase and ion channel, TRP-PLIK. 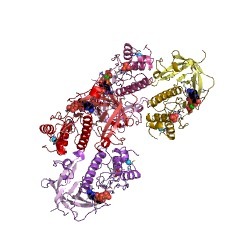 As part of the long transient receptor potential channel subfamily implicated in control of cell division, it is a protein that is both an ion channel and a protein kinase. TRP-PLIK phosphorylated itself, displayed a wide tissue distribution, and, when expressed in CHO-K1 cells, constituted a nonselective, calcium-permeant, 105-picosiemen, steeply outwardly rectifying conductance. The zinc finger containing alpha-kinase domain was functional. Inactivation of the kinase activity by site-directed mutagenesis and the channel's dependence on intracellular adenosine triphosphate (ATP) demonstrated that the channel's kinase activity is essential for channel function. Mapping of the novel protein kinase catalytic domain of Dictyostelium myosin II heavy chain kinase A.
Myosin heavy chain kinase A (MHCK A) in Dictyostelium was identified as a biochemical activity that phosphorylates threonine residues in the myosin II tail domain and regulates myosin filament assembly. 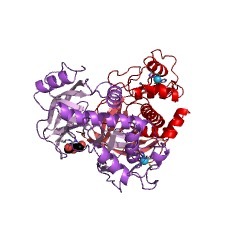 The catalytic domain of MHCK A has now been mapped through the functional characterization of a series of MHCK A truncation mutants expressed in Escherichia coli. A recombinant protein comprising the central nonrepetitive domain of MHCK A (residues 552-841) was isolated in a soluble form and shown to phosphorylate Dictyostelium myosin II, myelin basic protein, and a synthetic peptide substrate. The functionally mapped catalytic domain of MHCK A shows no detectable sequence similarity to known classes of eukaryotic protein kinases but shares substantial sequence similarity with a transcribed Caenorhabditis elegans gene and with the mammalian elongation factor-2 kinase (calcium/calmodulin-dependent protein kinase III). We suggest that MHCK A represents the prototype for a novel, widely occurring protein kinase family. 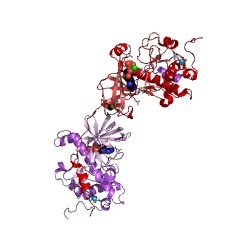 Structural analysis of myosin heavy chain kinase A from Dictyostelium. Evidence for a highly divergent protein kinase domain, an amino-terminal coiled-coil domain, and a domain homologous to the beta-subunit of heterotrimeric G proteins. We report here the cloning and characterization of the gene encoding the 130-kDa myosin heavy chain kinase (MHCK A) from the amoeba Dictyostelium. Previous studies have shown that purified MHCK A phosphorylates threonines in the carboxyl-terminal tail portion of the Dictyostelium myosin II heavy chain and that phosphorylation of these sites is critical in regulating the assembly and disassembly of myosin II filaments in vitro and in vivo. 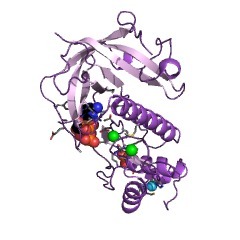 Biochemical analysis of MHCK A, together with analysis of the primary sequence, suggests that the amino-terminal approximately 500 amino acids form an alpha-helical coiled-coil domain and that residues from position approximately 860 to the carboxyl terminus (residue 1146) form a domain with significant similarity to the beta-subunit of heterotrimeric G proteins. No part of the MHCK A sequence displays significant similarity to the catalytic domain of conventional eukaryotic protein kinases. However, both native and recombinant MHCK A displayed autophosphorylation activity following renaturation from SDS gels, and MHCK A expressed in Escherichia coli phosphorylated purified Dictyostelium myosin, confirming that MHCK A is a bona fide protein kinase. Cross-linking studies demonstrated that native MHCK A is a multimer, consistent with the presence of an amino-terminal coiled-coil domain. Southern blot analysis indicates that MHCK A is encoded by a single gene that has no detectable introns. This information is based on mapping of SMART genomic protein database to KEGG orthologous groups. 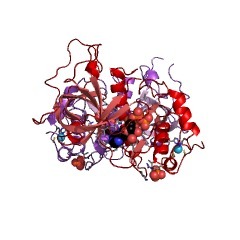 Percentage points are related to the number of proteins with Alpha_kinase domain which could be assigned to a KEGG orthologous group, and not all proteins containing Alpha_kinase domain. Please note that proteins can be included in multiple pathways, ie. the numbers above will not always add up to 100%.